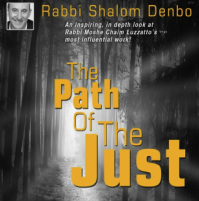 The Path of the Just was written in the mid 1700's by Rabbi Moshe Chaim Luzzatto. Although he was an extremely prolific writer, this was by far his most influential work. It is an extremely profound detailed guide to the perfection of one's character. Rabbi Noah Weinberg had a very unique approach to understanding the depth of this work. I had the unbelievable privilege to learn this approach individually with my beloved Rabbi. This series is an overview of that approach and covers the introductory chapter.